Take back the deck when the spectator has finished shuffling. Have another spectator peek at a card. You must now glimpse the spectator's card. (See Maximum Risk for information on this subject.) As soon as youVe glimpsed the card, hand the deck to this spectator for shuffling. Once more stress that he should shuffle the cards thoroughly. I've suggested having the deck shuffled by two different people, one before the selection and another after the selection. This is only because it helps dramatize the fact that the cards have been thoroughly mixed. There is no problem, however, with having the same person shuffle both times if you're working for only one spectator or if there is only one person in the audience who knows how to shuffle cards. Earlier 1 listed the setup in order. Here, of course, you don't have to concern yourself with the order. You just have to make sure you don't miss any of the necessary cards. I find it helpful to think of the cards in logical groups. You need to cull the queen through eight of spades, all four aces, all the kings except the king of hearts, and, in place of the king of hearts, the queen of hearts. My approach is to spread until I see one of the setup cards. I then cull the card and toss the next card on the table. Each time I cull a card I toss the next card on the table. If I encounter two setup cards together, I cull them both then toss the next two cards on the table. There is nothing sacred about this pattern. If, at some points it's convenient to deviate from it, I do so. With practice, this whole procedure should become almost automatic. The only thing that requires attention i6 remembering to remove the selected card when you come to it, since this is the only part that changes in each performance. Ii, after youve finished the cull, you realize that you did miss the selection, it's oi no great consequence. Just say that you're going to remove a couple of more cards to be safe. 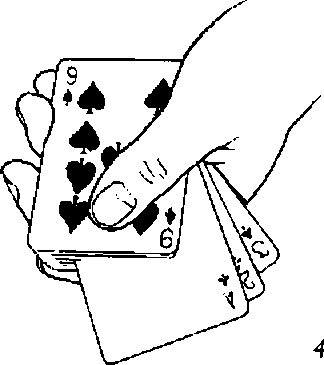 Spread through the deck and remove two or three cards, one of which is the selection. Once you have spread through the entire deck, spread through again quickly as if trying to decide on one more possibility. During this spread you do three things. First, you spread-count the setup cards on top of the deck. If you count anything other than thirteen cards, you know you've made a mistake. Take this opportunity to correct it. (Cull any card that you missed or get rid of any card that you culled accidentally.) Second, toss the card that is directly in front of the thirteen culled cards on the table with the others. Third, as you close the spread after having done so, injog the face card of the thirteen culled setup cards. Flip the deck face down into left-hand dealing grip. Square up the cards, taking a left fourth-finger break under the injog. Push the tabled cards toward the spectator. Tell him to shuffle them and then fan them out in front oi him like a bridge or gin rummy hand so that you cannot see the faces. As you say this, take the deck in your right hand in Biddle grip, your right thumb taking over the break. Table the deck and lift off all die cards above the break. Shuffle these cards and fan them in front of you. It should appear that you simply grabbed a group of cards in order to illustrate your comments. Once the spectator has fanned his cards in front of him, instruct him to sort them out by suit the way he might with a bridge or gin rummy hand. As you say this, casually sort your cards. It should appear that you're just randomly moving cards around to illustrate. In fact, you arrange your thirteen cards in setup order. Explain that you're going to try to identify the spectator's card by reading "tells" the way an expert poker ;|fj player does to determine if an opponent is bluffing. Advise him to try to maintain a poker lace. You will now lead the spectator to discard all the cards in his hand until he holds only his selected card. Since you know what the card is. this is an easy matter. You just have to make it look like you're doing it based on the spectator's subconscious reactions. The real purpose of this first phase is to allow you to set up the cards you need for the second and third phases. Nevertheless, you'll find that this phase is itself extremely effective with audiences. They don't know what to believe. Your claims sound impossible, yet there seems no other explanation. That's the source of this phase's strength. Gather up the spectator's cards and bury them in the deck anywhere below your thirteen-card setup. I simply faro the cards into the center of the deck. This further sells the notion that the cards are in random order. Scams ö Fantastes WITH Cards take a more direct approach and use sleight oi hand to deal yourself the stronger hand. Point out that there are nine possible ranks of hands at poker and name them for the audience. (These are the hands listed under Mental Preparation.) Explain that you're going to ask a spectator to choose any one of those nine ranks and, whichever he chooses, you'll attempt to locate the best hand of that rank that you can. Stress that, since you're not going to actually play poker, it doesn't matter whether he chooses a high hand, a low hand, or something in between. The important thing is that he can choose any hand and youll attempt to locate it. Name the nine ranks of hand again and ask a spectator to choose one. Your phrasing here is important. You don't want the spectator to say, "Give me a full house, nines over threes." Yet you don't want to explicidy instruct him not to specify the exact cards because you want the audience to think that you could produce a full house, nines over threes if you wanted to. By repeating the nine possible ranks of hands a couple of times, you make clear what you want from the spectator. By saying that you'll produce the highest hand of that rank you provide an implicit reason for not having him specify which cards compose the hand. When the spectator names a hand, you must recall the key number you memorized for that hand. You'll have to transfer this number of cards from below your break to above the break. For example, let's assume the spectator requests a flush. This means you must move your break seven cards lower. The pinky count approach is ideal because there is no visible handling. However, here is an alternative method for non-pinky counters that is also highly deceptive. Spread the deck between your hands while commenting about the impossibility of knowing where the necessary cards might be. When you reach your break, spread seven cards past it—you can count them by sight—and press the tip of your right second finger against the face of the seventh card as you continue spreading» When you square up, take a new left fourth-finger break at this point. This spreading action can be made to look very casual. Look at the audience as you start to spread. Glance down at the cards as you reach your break. As soon as you've finished sight-counting, look up again as you continue spreading to the bottom oi the deck. Naturally, you're pattering all the while. Either way, once you've obtained your new break, casually cut all the cards above it to the table. Then drop the remaining cards on top, At this point, the hand the spectator requested is on top of the deck. You're now going to cut the deck into five packets, executing a slip cut each time. The technique 1 recommend for the slip cut is as follows. With the deck lying lengthwise on the table, grip the deck with one hand at each end. The second and third fingers are at the outer corners and the thumbs at the inner corners. Your right forefinger should be straight, the tip pressing on the top card. This position is shown in illustration 1. Your left thumb lifts up all but about ten cards at the inner left corner. Your right hand now carries the cards below the break forward and to the right. At the same time, however, your right forefinger drags off the top card so that it lands flush on the lower portion as it clears the top of the deck. This action is shown in illustration 2. As soon as the right-hand cards have cleared the upper portion, your left lingers release the upper portion and your forefinger presses down on it, pinning it to the table. (You're trying to create the illusion that the left-hand cards were the original lower portion of the deck.) Your right hand continues forward with its cards, depositing them about a foot forward and to the right of the deck. Pick up the packet farthest irom you, the one you cut off first, and take it in dealing grip. Deal the face-up card onto the table. Pick up the next packet and drop it on the cards you're already holding. Deal its face-up card onto the one already on the table. Repeat this process with the remaining three packets. Pick up the faceup cards and drop them face down on the deck. At this point, part of your setup is on the bottom of the deck. These are the cards that you had shifted from below your fourth-finger break to above it (in our example, seven cards). YouVe now apparently going to bury the tabled poker hand in the middle of the deck. In fact, you perform a reverse double undercut to restore your stack. Thumb count to obtain a break over the seven (or however many) setup cards that are now on the bottom. Pick up the poker hand and drop it face down on top of the deck. Then double cut the cards below the break to the top. This kind of effect demands repetition. In the back of the audience's mind is the question, "Would it have worked if the guy had named a different poker hand?" At the same time, to succeed dramatically, the repeat must somehow take things further. This final phase meets those requirements. Point out that it's not enough to be able to locate whatever poker hand you want. In order to win the money, you have to be able to deliver that hand to yourself in a game. This, you point out, is known as stacking the hand, and that's what you're now going to demonstrate. Your thirteen-card setup is on top of the deck exactly as at the start of the second phase. As you patter, give the deck a jog shuffle retaining the setup. This will both reinforce the notion that the deck as a whole is mixed and convey that the poker hand you produced a moment ago is now lost. You now repeat your earlier overhand shuffle to centralize the setup. Undercut about half the deck. Injog the first card and shuffle off. Take the deck in left-hand dealing grip and square up the cards. As you do so, take a left fourth-finger break under the injogged card. Turn to another spectator and have him name any rank of poker hand just as before. As soon as he does, you know how many cards you have to shift from below the break to above. You do this exactly as in phase two, by either pinky counting or spreading the cards between your hands. Once you've established your new break, grip the deck from above with your right hand. Your left fourth finger now enters the break and angle-jogs the card above it very slightly to the right. Follow through by running your left thumb along the left side of the deck in a squaring action. Your left hand now pinches the deck at the left side and tables it in position for a riffle shuffle. The jog should be at the inner left side. Your left thumb lifts up on the jogged card so that your right hand can cut all the cards under it to the right in preparation for a riffle shuffle. The poker hand the spectator requested is now on top ol the right half. The rest of your setup is below this poker hand and/or on the bottom of the left half. You're now going to riffle stack the requested poker hand to fall to yourself in a five-handed game. To keep the shuffling brief I suggest a three-shuffle sequence. You'll stack one card on the first shuffle, two on the second, and two on the third. While running up your five-card hand, you must keep the rest of your thirteen-card setup intact. These cards will be on the bottom of the deck and/or direcdy under the hand your stacking. Therefore, you must make sure that the bottom few cards remain on the bottom, falling first during each shuffle. You must also ensure that you do not cut into the cards directly under the ones you're running up during the first two shuf fles. (You won't have to worry about this on the last shuffle since you're doing a false shuffle.) This is all easily done as long as you're conscious of the need to do it. I realize that if you're not adept at riffle stacking, the above won't make much sense to you. But, if that's the case, this effect is not really for you. The remainder of your setup is now on the top and/or bottom of the undealt portion of the deck. You're now going to exploit that fact. Generally speaking, the strongest way to end a poker routine is to deal yourself four aces or a royal flush. That's exactly what you're going to do now. Ill explain what happens in general terms, then explain a couple of exceptions in procedure. Allow the revelation of your poker hand to sink in. Then say that you're going to press your luck and try to improve the hand on the draw. Pick up your cards. Turn them face down and mix them a bit so the audience doesn't know which card is which. Fan the cards toward yourself and keep whatever cards you hold that are part of a spade royal flush. Discard the remaining one, two, or three cards. Draw that many cards from the deck, and then show that you're holding a royal flush. If your original hand is a full house, instead of drawing to a royal flush, discard a king and draw one card to give yourself four aces. If your original hand is a straight, flush, or straight flush you must perform an additional step. 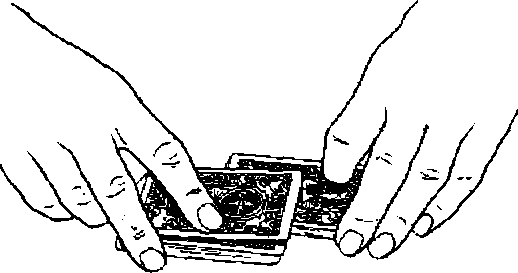 When you finish dealing, before putting the deck down, give it a casual overhand shuffle as you patter. Finish this shuffle by running the last few cards singly to the top. (Remember that during your riffle shuffles you were careful to retain the stack cards that were on the bottom.) After revealing your hand, talk about pressing your luck and proceed as before to draw to a royal flush. The shuffle won1t attract any heat because, when you do it, the audience doesn't know you're later going to draw cards. By the time you bring up the subject of drawing cards no one will remember the shuffle. If you're thoroughly familiar with your setup, you don't have to memorize these variant handlings, (although memorizing them is hardly a major burden). The logic of the situation will dictate how to proceed. Using a deck that they shuffled, perhaps even one that they provided, the audience has seen you psyche out an opponent, cut to any hand called lor, deal yourself any hand called for, and draw to a royal flush. What more evidence could anyone need that you'd he a very dangerous person to face at the card table?